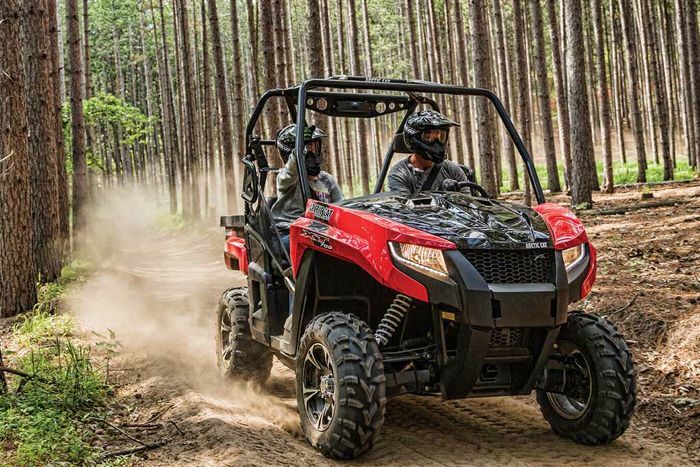 There are 15 new models, most notably a new XR ATV line, new Prowler XT models and a new 60-in. 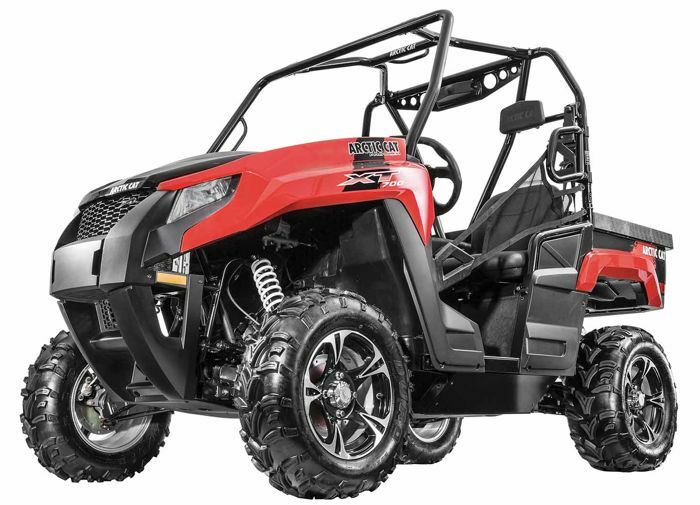 Wildcat Sport that slots in between the original Wildcat and Trail models. -All-new hood, bodywork and console for improved styling, greater usability and better ergonomics. 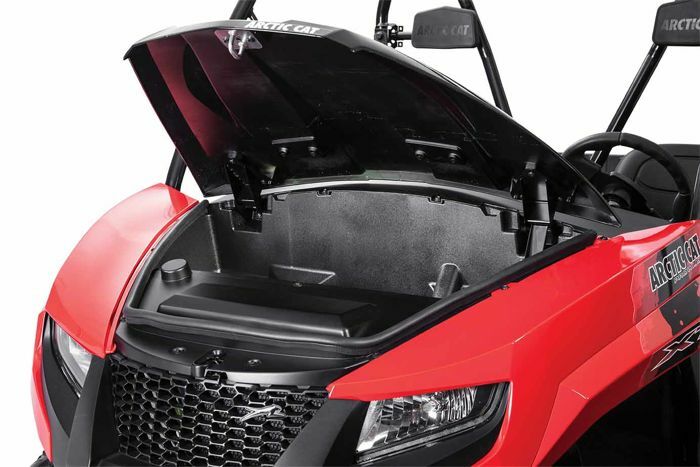 -New automotive-style hood features a new, more usable 3.0-cu.-ft. under-hood storage space (compared to 2.5-cu.-ft. for the previous space); an auto-style latch; integrated prop for keeping the hood open; weather-resistant sealing; ?and simplified access to the headlight adjusters, brake reservoir and radiator. -All body panels are now made from Surlyn, a premium quality plastic with molded-in color that maintains a higher quality finish. 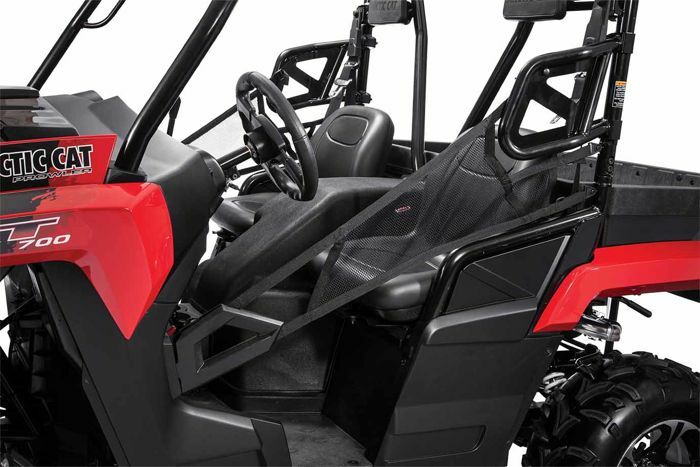 -New fully variable tilt steering mechanism offers greater overall range, infinite adjustability and increased room for driver entry and exit. The new design provides 3 in. additional legroom in the full- up position when compared to the previous model. 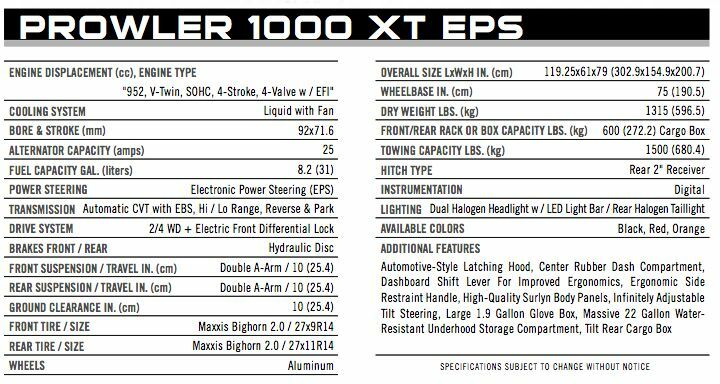 -New headlight system features a combination of LED and halogen bulbs for increased lighting options and improved light output. A four-position switch offers Off; LED Accent; Low Beam with LED Accent; and High beam with LED Accent. 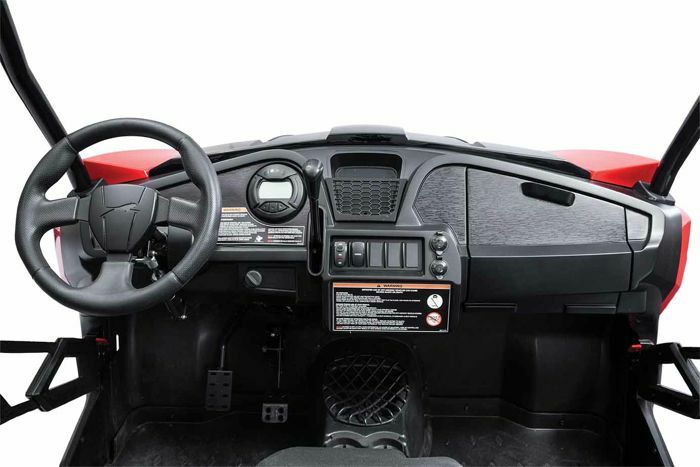 -New dash layout features a larger, 539-cu.-in. glovebox (compared to 234-cu.-in. for the previous box) plus an additional center-located, cubby space for small items such as electronic devices. -New occupant restraint system features lower-profile metal shoulder and foot restraints that ease vehicle entry/exit, with greater overall comfort. The new shoulder restraints provide 3.125 in. of additional space for each occupant. -New side-restraints feature a handle-lock (instead of a seatbelt-style buckle) for simplified access. -New closed-loop EFI system with catalyst exhaust provides 25 percent improved fuel economy and lower CO emissions for optimal performance in all conditions. 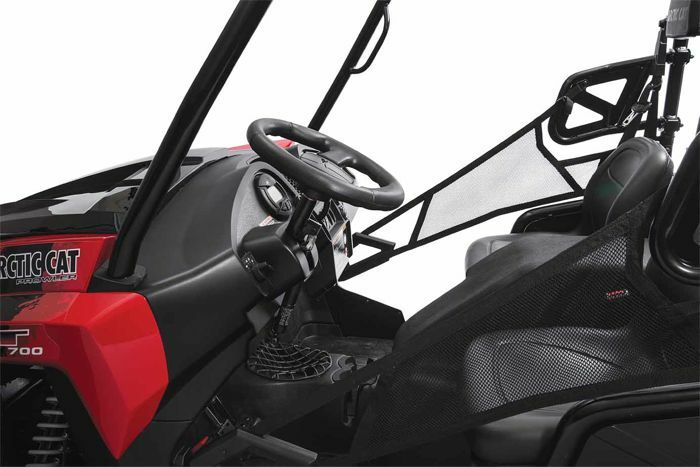 -New dash-mounted shift lever provides a more ergonomically friendly shift motion, delivering surer shifts. 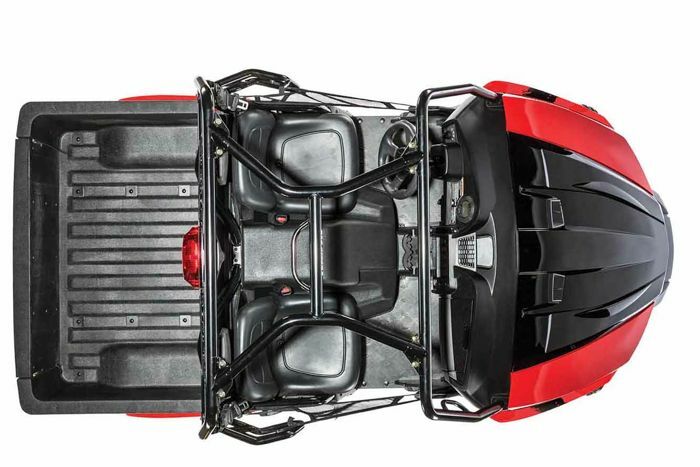 -New gas and brake pedals provide more comfortable heel- on-the-floor operation. -The fuse box and been relocated under the dash console (instead of under the seat) for easier and simplified access. -New 3-point seat belts are more comfortable and simplify operation. -Revised, softer shock calibration improves overall riding comfort. 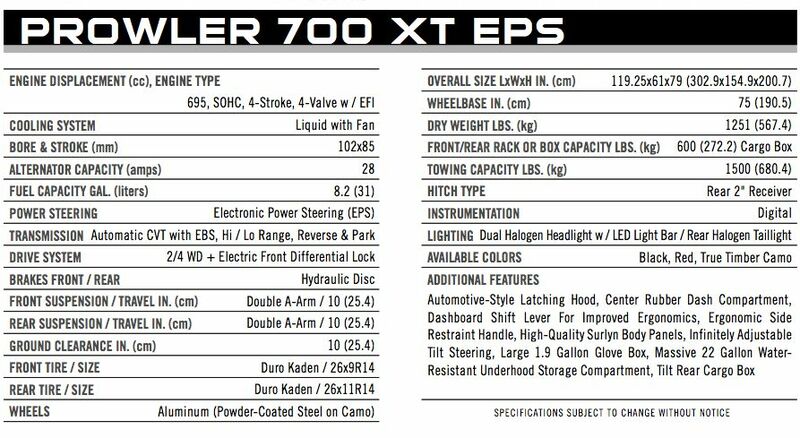 what is the price range of the Prowler 1000 XT EPS? When will the 2015 be available? Will there be any available in the Yuma AZ area? 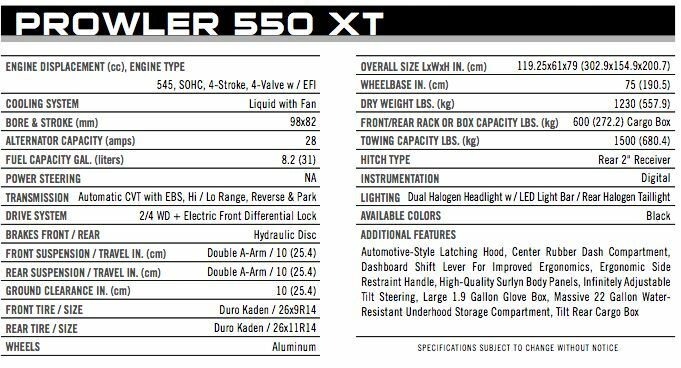 I have a 2015 side-by-side 550 prowler with the H1 engine. I have been losing power ever since the first beakdown. It keeps getting slower every time I get it back from the shop. I paid someone to look at it and they said I have about half the compression it should have but the dealer is saying it is fine. I have 82lbs compression and I believe it is supposed to be 155-175lbs. I lose power and speed going up hills. Down to 19mph, top speed is 42mph and that is with it floored. I used to be able to go around 55mph. How much compression am I supposed to have?